Find the Andromeda galaxy on these dark autumn nights. The large square pattern on today’s chart is the Great Square in the constellation Pegasus. 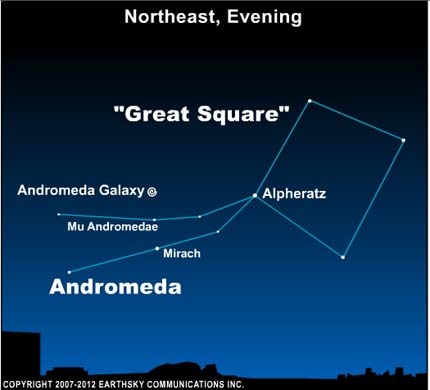 The constellation Andromeda can be seen as two streams of stars extending from one side of the Square, beginning at the star Alpheratz. I learned to find the Andromeda galaxy by star-hopping from the Great Square to the two stars marked here – first Mirach, then Mu Andromedae. An imaginary line drawn through these two stars points to the Andromeda galaxy. Just be aware – bright moonlight or city lights can overwhelm the faint glow of this object. 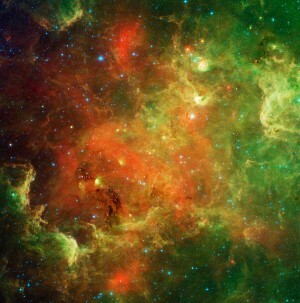 The single most important thing you need to see the galaxy is a very dark sky. Then the Andromeda galaxy appears to the eye as a rather large, fuzzy patch. One of you wrote, “I’ve heard that the Andromeda galaxy will someday collide with our galaxy! Is that still a definite possibility?” Actually, ‘definite possibility’ describes much of what we know – or think we know – about the universe. As for the Andromeda galaxy, and its future possible collision with our Milky Way … the first attempt to measure the radial velocity of this galaxy – its motion forward or back, along our line of sight – was made in 1912. After that, astronomers believed for some decades that the galaxy was approaching at nearly 300 kilometers per second, but later astronomers disagreed. Still, most galaxies do show a red shift, which is interpreted as a motion away from us. The Andromeda galaxy shows a blue shift, so it does seem to be moving toward us. That is all I have read about this, except to point out that the Andromeda Galaxy is 2.2 million light-years away, with a single light-year being almost 10 trillion kilometers. Therefore, even if this galaxy were approaching at 300 kilometers per second . . . it is nothing to lose sleep over. The Andromeda galaxy will be visible on dark, moonless evenings from now until the beginning of spring.